NASA assets in space and in the air are helping first responders deal with the ongoing volcanic outburst in Hawaii. Kilauea volcano, on Hawaii's Big Island, has been erupting pretty much continuously for the past 35 years. But Kilauea's activity ratcheted up considerably on May 3 after an earthquake rattled the region; lava began spilling from newly created fissures and spreading through neighborhoods, turning parts of the Big Island into disaster zones. "One of the first things emergency responders wanted to know was where the lava was coming out — where are all the fissures?" J. Carver Struve, NASA emergency management co-lead at NASA Headquarters in Washington, D.C., said in a statement. 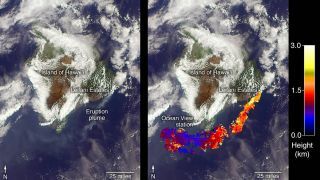 Seven scientific instruments aboard five NASA and partner satellites helped answer this question and have provided a wealth of other important data — the composition and size of newly emitted volcanic plumes, for example, and how, exactly, the movement of molten rock underground is deforming the ground on the Big Island. NASA scientists are also measuring the eruption from the air, using a G-III aircraft outfitted with an instrument called the Glacier and Land Ice Surface Topography Interferometer (GLISTIN). GLISTIN was designed to monitor ice sheets, but it can also detect changes in the Kilauea landscape caused by the outburst, agency officials said. Photographs by astronauts aboard the International Space Station have also helped researchers and responders better understand the outburst, as has data contributed by the European and Japanese space agencies, NASA officials said. "We're providing actionable scientific products to teams on the ground to support response activities and fill any gaps they may have in their information as the disaster is evolving," Struve said. You can learn more about NASA's Kilauea efforts here. Such work is part of the agency's Earth Science Disasters Program, which provides and helps to coordinate important data about wildfires, floods, hurricanes, earthquakes, oil spills and other disasters, both natural and human-caused.